Enjoy professional service, exceptional hygiene, and precision polishing by our specialists, in elegant spa surrounds. We offer a stunning variety of colours and finishes, from local cult brand Kester Black, to internationally renown Artistic Colour Gloss long-wear gel polish and naturally-derived Biosculpture Gel. At MISS FOX, we operate to the highest standards in health and hygiene. Our files and buffers are single use, and all metal tools and pedicure baths are thoroughly sanitised and disinfected. To maintain a service standard that is high-quality and highly personalised, the maximum group size for manicures and pedicures is generally two guests. To read about our hygiene, health and safety policies please see the base of this page. Please note that we do not offer French Manicure services, SNS/Acrylic or Nail Extensions but we do offer beautiful custom nail art on request. Email your ideas to us at enquiries@missfox.com.au for a personalised quote. With both Vegan Society and Cruelty Free accreditation, Melbourne-made Kester Black are known for their high-shine, chip-resistant nail polishes that follow the "10-Free™ Formula", meaning they are free of formaldehyde, toluene, DBP, camphor, formaldehyde resin, xylene, parabens, fragrances, phthalates and animal derived or tested ingredients, making them suitable for even the most sensitive hands and feet. To ensure the ultimate result, and exceptional hygiene, we include a brand new bottle of nail varnish to use and take home with every polish service. Valued at $20, it's a great way to remember your MISS FOX experience, and you can use your polish to touch up at home too. The classic manicure experience. Includes nail trim and file, cuticle care and tidy, gorgeous hand massage, and careful application of your very own take-home bottle of Kester Black nail polish, or a natural buffed finish. Includes foot cleanse and aromatic soak, foot rasp, toe-nail trim and file, cuticle care and tidy, and careful application of your very own take-home bottle of Kester Black nail polish, or a natural buffed finish. The perfect gift, topped off with bubbles! An indulgent experience featuring a luxe organic foot bath, exfoliation with delicious organic coconut sugar and a relaxing extended foot and calf massage. Includes foot rasp, nail trim and file, cuticle care and tidy, and careful application of your very own take-home Kester Black polish to finish. or FREE upgrade to long-wearing instant dry Artistic Colour Gloss gel polish. NAIL POLISH CARE ADVICE: Nail polish is a cosmetic treatment subject to all sorts of wear and tear, and unfortunately the paint finish can not be guaranteed for any length of time. Polish on the hands may last from a few hours to a few days depending on before-care, after-care, nail hydration, lifestyle etc. If you require a long lasting finish please book in for a Gel/Artistic service which we guarantee for at least 7 days wear. Nail polish takes 2-8 hours to fully cure so please bring open toe footwear for pedicures. Say goodbye to any fear of chipping, smudging or peeling as you leave the salon... With Artistic Colour Gloss, your nails are dry right away and will look fabulous and glossy for 7-21 days. LED lamp-cured to dry in 30 seconds and available in over 50 beautiful, high gloss colours. When you are ready for a new colour, Artistic Colour Gloss soaks off quickly and completely, with no damage to the natural nail. The perfect solution for busy people who want to look groomed for longer. Includes nail trim, smooth and file, and detailed cuticle care and tidy. Finish with a mini massage and and you’re good to go without any worry of bumps, dents or smudges. TIP: Remember to also book a Soak Off (Removal) with the Manicure if you are currently wearing Shellac/Artistic/Gel so that we have time to complete the removal service. Includes luxe foot bubble bathe, smoothing of rough skin, nail shape and file, and cuticle tidy. 2-3 colour coats and top coat leave you with a high gloss finish. Completed with a mini massage and Solar Oil application, you’re good to go without any worry of bumps, dents or smudges. TIP: Remember to also book a Soak Off (Removal) with the Pedicure if you are currently wearing Shellac/Artistic/Gel so that we have time to complete the removal service. The perfect upgrade to a Colour Gloss Manicure to add strength, and correct grooves, ridges and other surface imperfections. This protective hard-gel covering will promote healing and growth of the natural nail while creating a perfectly smooth foundation for your gel colour application. YOUR OWN LONGER, MORE BEAUTIFUL NATURAL NAILS! A NAIL REVOLUTION THAT PERFECTS WHAT NATURE ALWAYS INTENDED. IBX is a penetrating toughening treatment that fuses together the nail’s top layers to improve nail plate integrity under any Gel Polish Coating. It can also used to keep your natural nails strong so that they grow long. 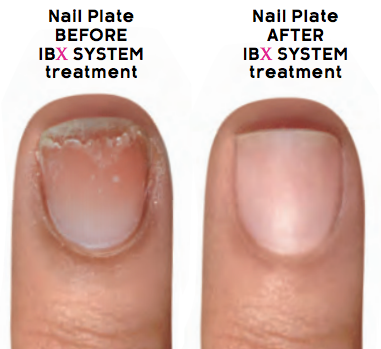 Often referred to as "Olaplex" for nails, IBX works inside the nail instead of sitting on top like traditional nail services. This intensive strengthening treatment works so you can build up length and durability, starting from the INSIDE OUT, toughening the natural nail and protecting against frequent removal. COLOUR GLOSS CARE ADVICE: Gel polish services can last anywhere from 7-21 days depending on a number of factors, such as the health of the nails to begin with, chemical exposure (eg. body care products and household cleaners), water exposure (nails that are often wet) and how fast your nails grow. Use gloves to protect your nails for any activities beyond normal wear and tear. If lifting or peeling is noticed please do not pick or pull at the lifted area, as this will cause the lifting to increase and could even damage the natural nail. Should your nails become otherwise damaged in the first 7 days, we offer a goodwill repair service free of charge. Call or email us to arrange a quick fix. Please note that repairs past the first 7 days are chargeable (unless a technical fault is determined). Please use our recommended cuticle oils twice a day to keep your natural nails and the skin surrounding them healthy, moisturised and flexible. Relative to your life-style and activity level, your Colour Gloss will need fortnightly maintenance as there will be obvious re-growth. At this stage we can remove the colour and repaint, or leave the nails clean. Gel polish doesn't come off with regular nail polish remover and should be professionally soaked off. Improper removal by peeling, forceful scraping, soaking fingers in a bowl of acetone, or using a drill can cause permanent pits, cracks, scrapes or thinning. MISS FOX use a caring, professional removal system, without drills, to leave your natural nail plate clean and healthy. Biosculpture Gel gives a beautiful non-chip colour for up to 3 weeks, whilst adding strength and protection to nails. Biosculpture Gel does not damage the natural nail and is quick and easy to remove. All Bioscupture gels are Vegan-friendly and not tested on animals. Made from a derivative of sugar cane - with no exposure to harsh chemicals or smells, it is perfect for those wishing to safely add durability to their natural nails. Cured using LED lights. Available in 15+ classic colours. Rebook in 3 weeks for maintenance. Includes nail trim, smooth and file, and detailed cuticle care and tidy. Finish with a mini massage and and you’re good to go without any worry of bumps, dents or smudges. *Note that this service does not extend the nail length, but rather adds protection to nails to allow them to grow longer naturally. For the best nail health, we do not offer an extension service. BIOSCULPTURE CARE ADVICE: Biosculpture Gel polish services can last anywhere from 7-21 days depending on a number of factors, such as the health of the nails to begin with, chemical exposure (eg. skin/body care products and household cleaners), water exposure (nails that are often wet) and how fast your nails grow. Use gloves to protect your nails for any activities beyond normal wear and tear. If lifting or peeling is noticed please do not pick or pull at the lifted area, as this will cause the lifting to increase and could even damage the natural nail. Should your nails become damaged in the first 7 days, we offer a goodwill repair service free of charge. Call or email us to arrange a quick fix. Please note that repairs past the first 7 days are chargeable (unless a technical fault is determined). Please use our recommended cuticle oils twice a day to keep your natural nails and the skin surrounding them healthy, moisturised and flexible. Relative to your life-style and activity level, your Biosculpture will need 2-3 weekly maintenance as there will be obvious re-growth. At this stage we can remove and reapply Biosculpture, or leave the nails clean. Gel doesn't come off with regular nail polish remover and should be professionally soaked off. Improper removal by peeling, forceful scraping, soaking fingers in a bowl of acetone, or using a drill can cause permanent pits, cracks, scrapes or thinning. Leave it to MISS FOX, where we use a caring, professional removal system to leave your natural nail plate clean and healthy. NAIL HEALTH AND SAFETY: At MISS FOX, we operate to the highest standards in health and hygiene. Our files and buffers are single use, and all metal tools are thoroughly cleaned and treated with hospital-grade disinfectant. Pedicure buckets are disinfected using a hospital-grade antibacterial bleach soak. Your cuticles are part of your live skin. Cutting them could open the door to infection or irritation, and lead to nail problems such as ridges, white spots and lines or ragged edges. At MISS FOX, we use a professional AHA solution to dissolve dead skin, and gently push the live cuticle back. We never cut live cuticle. Only hangnails and dead skin will be carefully nipped. For this reason, it may take several manicures or pedicures to tame cuticles and restore them to their proper condition if they have been cut for some time at home or at another salon. There are some conditions (like corns, warts and fungus) which makes it necessary and wise for you to see a podiatrist or doctor. For safety, MISS FOX nail technicians do not use blades on the feet, or treat nails or feet affected by conditions that require medical attention.